New York Times, USA Today, Wall Street Journal and international bestselling phenomenon David Weber delivers the first entry in an original young adult science fiction adventure series, the Star Kingdom saga! 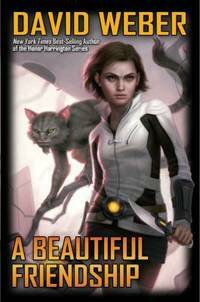 Young teen Stephanie Harrington forms a telepathic bond with an intelligent alien treecat on a pioneer planetâÈ'and must fight for the freedom of her new friend and his species against highly-placed enemies determined to claim the world for humans only. Stephanie Harrington always expected to be a forest ranger on her homeworld of Meyerdahl . . . until her parents relocated to the frontier planet of Sphinx in the far distant Star Kingdom of Manticore. It should have been the perfect new home --- a virgin wilderness full of new species of every sort, just waiting to be discovered. But Sphinx is a far more dangerous place than ultra-civilized Meyerdahl, and StephanieâÈçs explorations come to a sudden halt when her parents lay down the law: no trips into the bush without adult supervision! Yet Stephanie is a young woman determined to make discoveries, and the biggest one of all awaits her: an intelligent alien species. The forest-dwelling treecats are small, cute, smart, and have a pronounced taste for celery. And they are also very, very deadly when they or their friends are threatened . . . as Stephanie discovers when she comes face-to-face with SphinxâÈçs most lethal predator after a hang-gliding accident. But her discoveries are only beginning, for the treecats are also telepathic and able to bond with certain humans, and StephanieâÈçs find --- and her first-of-its kind bond with the treecat Climbs Quickly --- land both of them in a fresh torrent of danger. Galactic-sized wealth is at stake, and Stephanie and the treecats are squarely in the path of highly-placed enemies determined to make sure the planet Sphinx remains entirely in human hands, even if that means the extermination of another thinking species. Unfortunately for those enemies, the treecats have saved Stephanie HarringtonâÈçs life. She owes them . . . and Stephanie is a young woman who stands by her friends. Which means things are about to get very interesting on Sphinx. About A Beautiful Friendship: âÈêItâÈçs rare to find teen science fiction that strays beyond popular dystopian fare. The environmental messages, human-animal friendship, humor, action, and inventive technology will make this series starter an easy hit. . . .âÈëâÈ' Booklist About David Weber and the Honor Harrington series: âÈê. . .everything you could want in a heroineâÈö.excellentâÈöplenty of action.âÈëâÈ' Science Fiction Age âÈêBrilliant! Brilliant! Brilliant!âÈëâÈ'Anne McCaffrey âÈêCompelling combat combined with engaging characters for a great space opera adventure.âÈëâÈ' Locus âÈêWeber combines realistic, engaging characters with intelligent technological projection. . .Fans of this venerable space opera will rejoice. . .âÈëâÈ' Publishers Weekly Comprehensive Teacher's Guide available. Baen. Hardcover. 1451637470 Item in very good condition! Textbooks may not include supplemental items i.e. CDs, access codes etc... . Very Good. Baen Books, 2011. Hardcover. Good. Disclaimer:A copy that has been read, but remains in clean condition. All pages are intact, and the cover is intact. The spine may show signs of wear. Pages can include limited notes and highlighting, and the copy can include previous owner inscriptions. At ThriftBooks, our motto is: Read More, Spend Less.Dust jacket quality is not guaranteed. Baen Books, 2011. Hardcover. Acceptable. Disclaimer:A readable copy. All pages are intact, and the cover is intact. Pages can include considerable notes-in pen or highlighter-but the notes cannot obscure the text. An ex-library book and may have standard library stamps and/or stickers. At ThriftBooks, our motto is: Read More, Spend Less.Dust jacket quality is not guaranteed. Baen Books, 2011. Hardcover. As New. Disclaimer:An apparently unread copy in perfect condition. Dust cover is intact; pages are clean and are not marred by notes or folds of any kind. At ThriftBooks, our motto is: Read More, Spend Less.Dust jacket quality is not guaranteed. Baen Books, 2011. Hardcover. Very Good. Disclaimer:A copy that has been read, but remains in excellent condition. Pages are intact and are not marred by notes or highlighting, but may contain a neat previous owner name. The spine remains undamaged. At ThriftBooks, our motto is: Read More, Spend Less.Dust jacket quality is not guaranteed. Baen Books, 2011. Hardcover. Acceptable. Disclaimer:A readable copy. All pages are intact, and the cover is intact. Pages can include considerable notes-in pen or highlighter-but the notes cannot obscure the text. The dust jacket is missing. At ThriftBooks, our motto is: Read More, Spend Less. Baen Books, 2011. Hardcover. Good. Disclaimer:A copy that has been read, but remains in clean condition. All pages are intact, and the cover is intact. The spine may show signs of wear. Pages can include limited notes and highlighting, and the copy can include previous owner inscriptions. An ex-library book and may have standard library stamps and/or stickers. At ThriftBooks, our motto is: Read More, Spend Less.Dust jacket quality is not guaranteed. Baen. Used - Very Good. Former Library book. Great condition for a used book! Minimal wear. Baen. Used - Good. Former Library book. Shows some signs of wear, and may have some markings on the inside. Baen. 2011. Hard cover. Fine in fine dust jacket.. Glued binding. Paper over boards. With dust jacket. Star Kingdom (Hardcover). Audience: Young adult; Children/juvenile. . No previous owner's name. Clean, tight pages. No bent corners. first printing . Baen. Hardcover. 1451637470 No CD Included. Access code may be previously used. Light dirt, wear, fading or curling of cover or spine. Good Binding. Minimal, if any highlighting or writing. Cover has used book stickers or residue. . Very Good. 2011. Baen, 2011-10-04. 1. Hardcover. Fine. Baen Books, 2011 Book Club Edition. . Hard cover. 4. Very good in very good dust jacket. Just the slightest hint of wear on edges of book and jacket. Like new binding, clean pages. Near new condition. 361 p. Star Kingdom (Hardcover)..
Baen. Hardcover. 1451637470 Ships from Tennessee, usually the same or next day. . New. 2011. Baen, 2011-10-04. Hardcover. Very Good. Baen. Hardcover. 1451637470 *LIKE NEW* Ships Same Day or Next! . Fine. Baen. Hardcover. 1451637470 *BRAND NEW* Ships Same Day or Next! . New.